Deciding to participate in a clinical trial or research study can be both exciting and daunting. The key is getting all of the information necessary to make the best decision prior to enrolling in a study. It also means continuing to be informed while you are participating in a clinical study. And, remaining informed about the study and its importance to Parkinson’s research once your participation ends. We were among a group of Parkinson’s advocates who developed a checklist to help you make an informed decision about enrolling in a clinical study. We hope that once the checklist becomes available in March 2009, you will bring it with you to meetings with clinical research staff and use it as a guide to help you get the most out of your discussions. 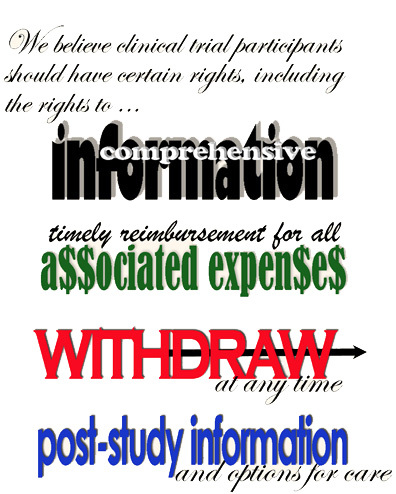 The checklist questions are based upon principles outlined by the same Parkinson’s advocates in the Declaration of Clinical Research Rights and Responsibilities for People with Parkinson’s Disease. Our goals are to increase awareness about clinical research studies, empower PWPs to have a more active role as a clinical research participant, and inform the clinical research community about the needs of Parkinson’s research participants. about a clinical study prior to enrollment. considering halting or terminating a study.